we are all more likely to buy in case advertising and communication is well timed. So let's see what can retailers do to increase holiday sales by making use of these facts. Consumers plan to use their smartphones to shop and research during small windows of free time (while walking or commuting). Matt Lawson, director of performance ads marketing for Google, refers to these bits of time as "micro-moments”, adding that there is one simple guideline - be present. According to research 52% of all customers intend to use smartphone before visiting a store and 82% plan to consult their phone while in store. Optimising the use of free time also reflects on consumers behaviour during last year’s holiday season. 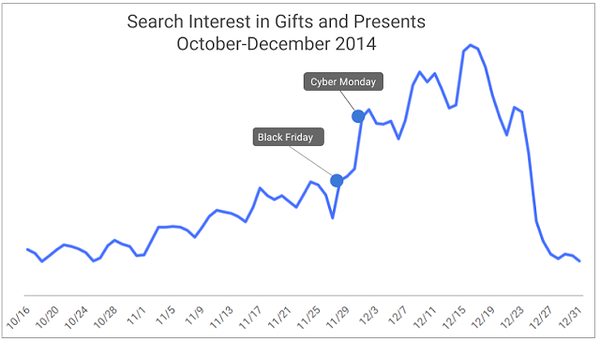 According to Google Trends interest for gifts and presents was fairly consistent and peaked a week before Christmas. Day-long shopping marathons will still be there as well. A study conducted by Edelman Berland shows that majority of holiday shoppers are postponers. 65 % of people will do their shopping within the last two weeks of the season. A similar trend is visible in a survey by Ipsos MediaCT which finds that even though 61% of shoppers started researching Christmas purchases before Thanksgiving weekend the majority of purchasing will be done just before Christmas. So the time to reach for these holiday shoppers is now. A lot of spending will still be done in the the last few weeks. A simple “thank you” message after the purchase goes a long way to exceed customers' expectations and helps your brand stand way above the competitors. Another recent Ipsos study finds that holiday shopping actually puts customers in a better mood. Comparing responses from shoppers before and after their holiday shopping trips, 68% more people described their mood as “happier” after they completed their shopping trips than before. A number of factors may explain this: retailers providing a great customer experience; people being glad to have completed their shopping tasks; or simply feeling happy to have a few more euros left in their pockets than the same time last year. All of these factors can be influenced with good communication. For example with a simple “thank you” message after the purchase enhances the experience and helps your brand stand way above the rest. By sending your customers relevant offers you may help them solve an ancient mystery like “what should I give my wife?” and complete their shopping tasks with less effort. A promotion code will give your customer a feeling of saving a few euros. Timing your messages to the clients should not be underestimated. In terms of flexibility and timing nothing beats SMS as the medium for call to action as about 90% of all text messages are read within three minutes of delivery. The optimal time of sending messages course depends heavily on the product or service being advertised. A promotional SMS at 9pm may be perfect for an online movie streaming service but may not suit a restaurant as the dinner choices are often made by this time. From among all weekdays Mondays have shown the lowest percentage of response compared every other day of the week. Friday, Saturday and Sunday have shown the best results for the retailers. This is not surprising when looking at the statistics for shopping on mobile devices. 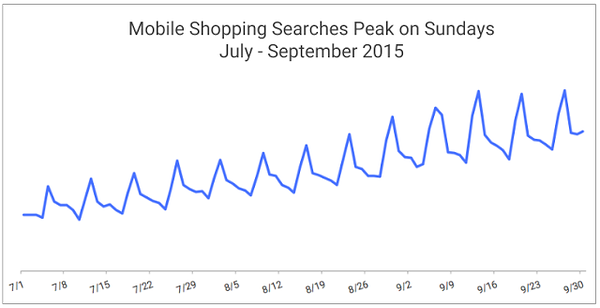 Based on its Q3 2015 data Google found that mobile shopping searches are on average 18% higher on Sunday versus the rest of the week. Retailers have a interesting task in front of them - capturing the free moments of a smartphone shopper and staying top of mind for the last week of mall marathons. Hopefully keeping all this in mind will help you boost your Christmas sales.